Tumoral calcinosis has a nodular architecture with fibrous septa coursing between nodules. 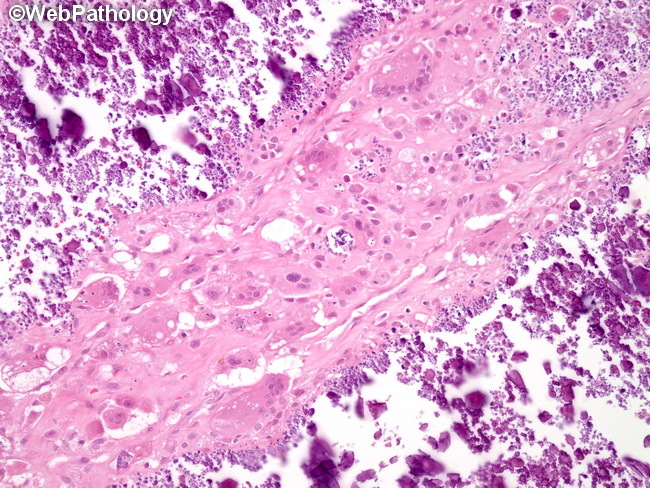 During the active phase of the lesion, the nodules show a central area of calcification surrounded by macrophages, osteoclast-like multinucleated giant cells (several seen in this image), fibroblasts, and chronic inflammatory cells. The cellularity decreases during the inactive phase, leaving behind amorphous or granular calcified material bordered by dense fibrosis.